The spring edition of the B&G Alumni magazine is now available. In this issue, you will find a story outlining the new Aquaponics project, Ichthus, authored by a student. 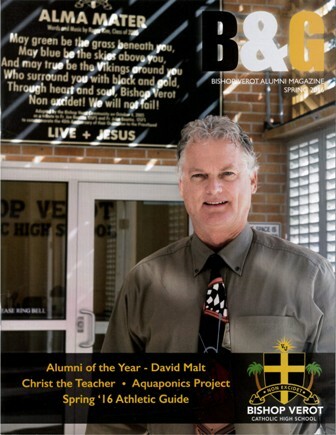 There is also an informative article about Bishop Verot's Model UN competition in Washington D.C., the March for Life trip in January, and our 2016 Alumni of the Year recipient. As always, our alumni are spotlighted in the Alumni Sports and Alumni News sections. Please feel free to send in your Alumni News to communications@bvhs.org.